Passed onto me by our Reviews Editor as he thought it would be something I might like, the very grand sounding Progmium are a quartet put together by Tim Surkovich to record music to the words that he was writing after being diagnosed with Multiple Sclerosis. Hailing from Hollidaysburg, Pennsylvania, singer Randy Sciarrillo, bassist Rob Cunningham, drummer/keyboard player Dave Shaffer and guitarist/keyboard player J. Luis Morales have done a good job of transferring Surkovich's understandable mood swings into a Progressive Metal rollercoaster ride. At its best 'Project Diagnosis' hints at Dream Theater, Pink Floyd and Fates Warning, with all the time and tempo changes we've come to expect from the genre. However, a flat production, an overdose of sombreness and Sciarrillo's sometimes ordinary delivery also remind me of bands like Dead Soul Tribe, Tiles and a few others who had undoubted talent but never quite managed to make an album that had good songs all the way through. Having said that, the slow and moody 'Numb', the powerful 'Denial' and the lengthy tangle of riffs and drum rolls that is 'The Beast Within' are most enjoyable. 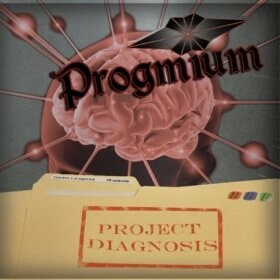 Progmium suffer the most when they try to Rock out, simply because the production and the vocals can't adequately convey the intensity needed, but the more low-key ballad 'Glimmer Of Hope', the clever 'As I Am' and the brooding atmospherics of 'Take Up The Fight!' are good examples of quality song-writing. It's been hard not to give this album a better review, especially as seventy-five per cent of the proceeds go to the National Multiple Sclerosis Society, and if it opens some eyes and raises money and awareness, then it'll have done its job. Available from the band's website (www.progmium.com), the dark music and even darker subject matter may well appeal to some.